The beginning of 2018 has already been a whirlwind at Wags and Walks. We don’t know about you, but it’s been tough for us to take a step back and create those “New Year’s Resolutions” we always promise ourselves we will do. What we do know is that every year we are dedicated to saving more dogs than ever before, and 2018 feels like it is going to be a great year to do just that. To start, 2018 just so happens to be the year of the Dog, according to the Chinese Zodiac. So, if you are still searching for your 2018 resolution, this may just be the astral sign you needed. From spending more time around dogs to pitching in at organizations and shelters you care about, there is no shortage of ways you can incorporate (wo)man’s best friend into your New Year routine. To help you get started, we rounded up 6 ways you can show your support for dogs in need in 2018! Donating to a cause in support of dogs doesn’t necessarily need to be giving money. You could donate pet supplies like dog beds, toys, leashes, treats or food! These items help rescues and shelters take in and care for more homeless dogs than they otherwise could. Donating can also mean donating your time or your skills. Many of the people who work with Wags and Walks do so as volunteers, donating their time to be around our dogs or care for them, or donating some of their skills like those who volunteer to take photos, help us on our website, or pitch in with our social media initiatives. Princess, relaxing in the sun. Organizations like Wags and Walks rely heavily on the volunteers and generous donors in our community. Without your support, we wouldn’t be able to rescue any dogs from homelessness, and so we thank you! Facebook now allows you to convert your birthday into a fundraiser, which in our opinion is one of the best things Facebook has done in awhile. When your birthday rolls around this year, consider supporting a fundraiser related to rescue dogs in need. This is an amazing way to share causes you believe in with your friends and create a community of giving! Wags and Walks rescues dogs from high risk, stressful situations, and it is not uncommon for these dogs to require some rehabilitation before they are ready to find their forever home. This sometimes comes in the form of socialization or training, but it can also be related to attending to medical issues. We want to rescue every dog we can and create a better life for him/her. In order to continue rescuing dogs in need of severe medical attention, we call on our community to help us with the medical bills. 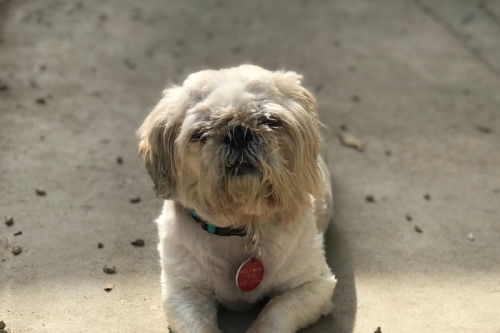 We have created a Dogs in Need page on our site where you can learn more about the stories of Elle, DeeDee (pictured below), and our other dogs in need of immediate medical attention. If your birthday is around the corner, consider picking one of them as your fundraiser of choice! Elle was just recently rescued with two fractured legs. We are fundraising to fund her surgery and rehab! DeeDee has a bad case of pneumonia, and we are halfway to reaching our goal to support her! Being an advocate can take many shapes. It could be as simple as sharing photos and videos on your social network to raise awareness about animals in need or as dedicated as organizing drives to help homeless dogs. Being an animal rights advocate can also mean reporting any animal abuse or neglect you may see occuring around you. Starting your journey as an animal rights advocate includes learning about dogs and their needs, as well as, educating yourself on different legislation surrounding animals. Once you know, you can spread this knowledge amongst those around you. We find a great resource for budding animal rights activists to be none other than the ASPCA’s website! It is full of information to help you learn the facts and start getting involved. Wags and Walks has a program, Wags Club, where volunteers can sign up for times to come walk and hang out with some of the dogs who aren’t yet with a foster. By volunteering with Wags Club, you help socialize, exercise, and comfort our rescue dogs, which greatly aids in keeping the dogs healthy and happy while we find them forever homes! This human interaction also significantly increases their chances of adoption. With all this dog walking experience you’ll be getting, you may decide to launch your own dog-walking career in 2018! Fostering dogs for a shelter or rescue organization like Wags and Walks is a momentous contribution to rescue dogs everywhere. Fosters allow us to pull more dogs from shelters that are at capacity or are that unable to find a home for the dog. The more people who can take care of dogs in need while we help find them forever homes, the more dogs we can save. While fostering can help save the life of a dog, we’ve also seen it change the life for the people who volunteer. It is a great experience to learn more about what it is like to be a dog’s companion, all while helping a dog in need. If you are still on the fence about fostering, check out one of our Foster Fridays articles and read about the experiences of some of our current fosters. Yep, we said it. The last item on this list is adopting a dog. How could we talk about New Year’s Resolutions, and dogs, and Wags and Walks and not mention it? Bringing a rescue dog into your home can be one of the most rewarding experiences, but we don’t think adopting an animal of any kind is a decision that should be made hastily in the early hours of January 1st! Before heading into applying to adopt a dog, we recommend reading about what it means to adopt dogs of different ages and sizes, and spending time around potential adoptables to you ensure you bring home the right dog for you and your family. Millie, on the lookout for her furever home! Pro tip: If you are on your weekly walk around your favorite park and pass a dog wearing one of these little bandanas that says, “adopt me!”, it’s a sure sign this dog is looking for a forever home. Take a moment to say hi, you never know where that first hello may lead. If you do have interest in adopting a dog, check out our other available dogs for adoption. Also, stop by our Adoption Center opening on the 27th, all are welcome! We hope to see you there! To stay updated on what’s new at Wags and Walks, please follow us on Instagram, Facebook, and Twitter. Also, don’t forget to sign up for our e-mail newsletter. Who doesn’t love cute animal pupdates?